I wonder how long I’ll keep trying to convince myself that fall isn’t my favorite season. I love summer. Sunlight till 9. Grilling out. Fireflies. Swimming in lakes. But fall is pumpkins and wool and leaves ablaze. Fall is looking back on a great growing season with satisfaction — and relief. You’re through fighting weeds. Fall is layers of clothing without buckets of sweat. Mostly, I’m cold a lot, and there are more opportunities to be cold in fall than in summer. But maybe I need to remember apples and grab a sweater when I’m feeling chilled. There’s a glowing quality to these apples. You can guess how I feel about my annual orchard trip. I love the smell of fermenting apples underfoot and the glowing matte skin of some varieties, the smooth shiny skin of others. 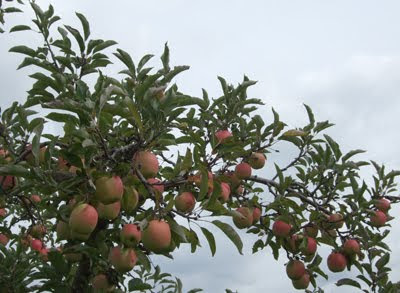 I tried a new orchard this year, Door Creek Orchard, and I may make a return run yet this autumn. I went home with my beloved Honeycrisps and some Greenings and Wolf Rivers, both of which were recommended as superior baking apples. I had a pie crust in the freezer, so the first order of apple-baking business was a pie, predictably. But this is my first freestyle pie. I consulted a few cookbooks and decided to wing it. 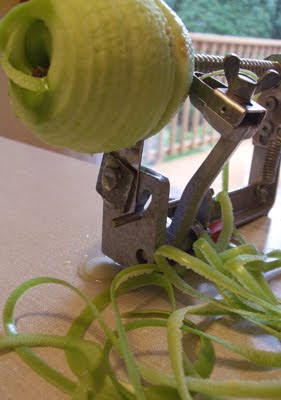 The apple corer/peeler is a fast-working tool that makes neat ribbons of peel, but it’s messy (look at that puddle of juice — and that’s just from one apple) and hard to clean. 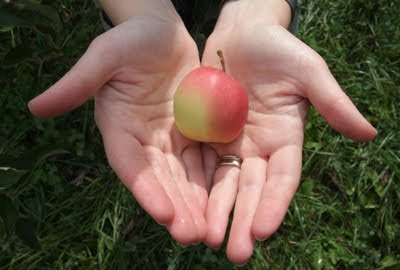 It has a tendency to crush softer apples. The Greenings, however, pass through it just fine. I used both kinds of baking apples, the Greenings and the Wolf Rivers. 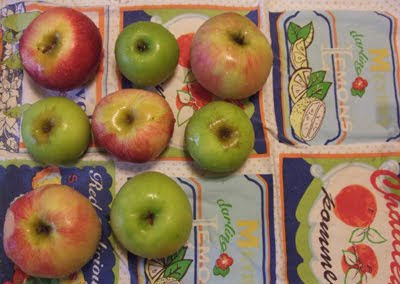 Greenings are similar to Granny Smiths: firm and green. They easily pass through a corer/peeler, an admittedly silly and unnecessary kitchen tool, but one that’s fun to use nevertheless. The Wolf Rivers, on the other hand, didn’t stand up as well to the corer/peeler. I pre-peeled the Wolf Rivers before sending them through the corer, and broke up the bigger chunks by hand. Despite their softness, Wolf Rivers are more flavorful than the Greenings. The Wolf Rivers have a tartness that cuts through the white-sugar sweetness of the pie filling. 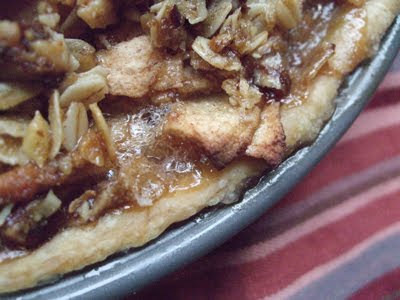 Using more than one kind of apple in a pie adds so much to the overall texture and flavor. The pie filling is coated with spices, sugar, and brandy. A few words about my other pie-making decisions: Brandy. Go ahead. Add some to the filling. Or whiskey. Or rum. Take that nip out of fall by putting a nip in your pie. I picked brandy because I’m a Wisconsin girl, and that’s how we roll in the Badger State. (I take my Old Fashioneds sweet, by the way.) I assure you, though, that this pie isn’t boozy. If you please, you could leave out the liquor. There’s a notable conversation going on between the brandy in the filling and the ginger in the streusel. They’re both warm and spicy, but each in its own way. And both add a needed bottom note to the tangy, sweet pie filling. 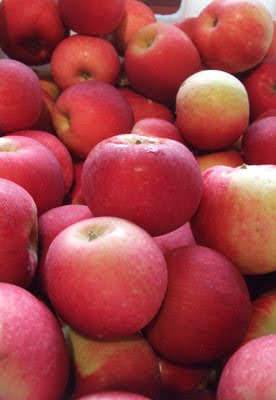 Fluorescent apples dazzle on an autumn day at Door Creek Orchard. This is the first post of a series about apples (I’ve called the series “Eats of Eden”), so I hope you’re ready for more of this supreme fall fruit. Two recipes (and a bonus recipe) follow. First up, it’s pie dough. This recipe makes two 9-inch pie crusts (or a shell and a lid if you’re fixing to make a double-crust pie). Why is it called “3-2-1”? It’s a ratio: three parts flour, two parts fat, one part water. Cold butter is key to making pie dough. 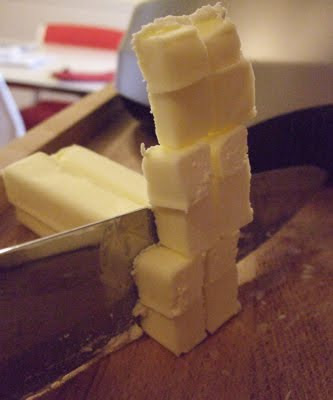 Sticks of butter straight out of the fridge are easy to cut. As ingredients warm, dough becomes sticky and hard to handle. 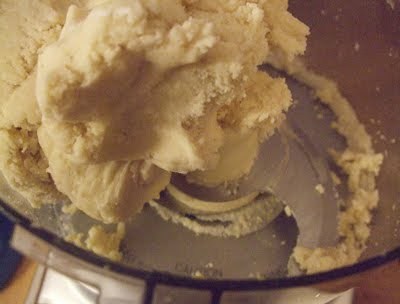 Add flour and butter to the bowl of a food processor. Blitz until dough comes together in wettish crumbles; it should remind you of wet sand. It’s OK (and preferred) to have some pea-sized bits of butter in the mix. Add salt. Add ice water in increments, giving one-second blitzes after each addition. Add only enough ice water so that the dough comes together. (You may not use all the water.) When it has combined, the dough will pull away from the blade. Overworking the dough will make it tough. Don’t worry about streaks or chunks of butter; they’re like hidden treasure in your delicious crust! Split into two equal dough balls. (Using a scale here is good.) Wrap each ball in plastic wrap and chill for at least 30 minutes. Chilling the dough will make it easier to roll out. Process dough until it just comes together. This dough freezes well. I made a batch and used one crust right away. With the sister crust, I rolled it out, put it in a pie tin, and covered it with a layer of plastic wrap and two layers of aluminum foil. Then into the freezer it went. When I decided to make the apple pie, I pulled the tin out of the freezer and let it thaw in my fridge for a couple of days (not because it took that long to defrost, but because it took me that long to get to pie-making; I think an overnight thaw would suffice). I made the pie filling, dumped it lovingly into the thawed crust, and baked up the whole business to great success. I’ve read about freezing dough in balls or discs, and then rolling them out after they’re thawed. I’ve also read about rolling out dough into the appropriate crust thickness and diameter, and then freezing the crust flat on a piece of cardboard with parchment paper to keep the dough from sticking. (The dough would be wrapped in plastic wrap and aluminum foil or placed in a freezer bag, of course — whatever you need to do to avoid freezer burn.) The flat-stack technique is a good way to save space in your freezer. How do you freeze dough? Bake the pie until the filling is thick and bubbling. Here’s recipe No. 2: the pie. This recipe makes enough filling for one 9-inch pie and a smallish apple crisp (about 2 inches deep in a 7 1/2-inch casserole dish). Peel, core, and thinly slice the apples. Squeeze the half lemon over the slices to prevent browning. Gently stir the apples without breaking too many of them to distribute the lemon juice. I like to use my hands. I used a handy-dandy apple corer and peeler to prepare apples for the pie. 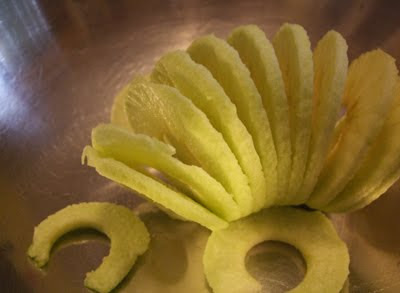 It slices the fruit into spirals. 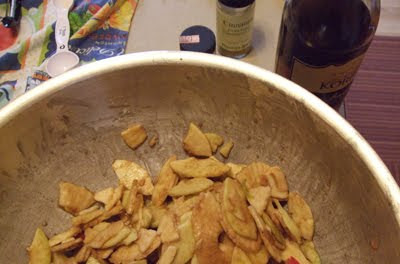 Add brandy, sugar, cornstarch, cinnamon, and cake spice to the apples. Stir gently or use your hands to coat apples. Time to make the streusel topping. Toast pecans and walnuts in the heated oven for about 6 minutes or until fragrant. (The pecans will verge on looking burnt.) Allow the nuts to cool before chopping them. 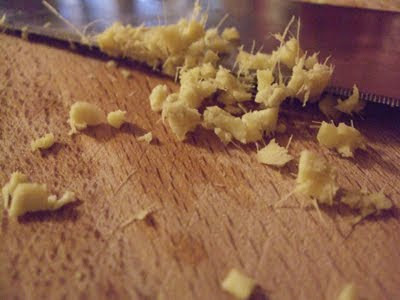 A little bit of fibrous ginger packs a big punch. Meanwhile, melt butter in a pan on the stove. When it’s lightly foaming, add minced ginger and cook for about a minute. You’re taking the raw edge off the ginger. In a small bowl, pour the melted butter and ginger over chopped nuts and oats. Add brown sugar and mix. Taste the streusel and adjust flavors to your discretion. The pie is topped with streusel and ready for the oven. Put the pie filling in the crust. (There will be 2-3 cups of leftover filling; use your best judgment to not overfill the pie.) Top pie with streusel. Reduce heat to 375 degrees and bake for about 55 minutes. (If the crust isn’t browning, fold back the foil to expose it.) Remove foil, reduce heat to 350 degrees, and bake for 5 minutes. The filling should be lightly bubbling. Washed apples dry on a towel. The green apples are Greenings; the red-and-yellow guys are Wolf Rivers. Using the foil may be a bit paranoid, but I’d rather bake a littler longer than burn my pie. 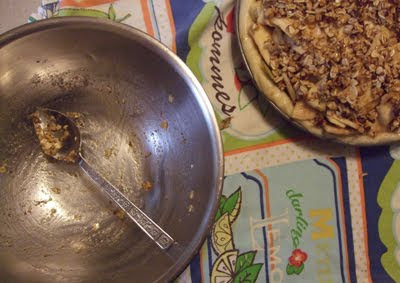 The long baking time also was caused by the apple crisp that I baked at the same time. The bottom line is to watch your pie to make sure the streusel and the crust don’t burn! 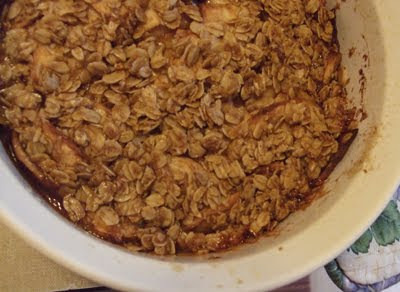 During the pie’s 20-minute bake at 425 degrees, prepare the bonus apple crisp! Coat a smallish casserole dish (or multiple smaller dishes) with nonstick spray (or butter). Put the leftover filling in the dish(es). 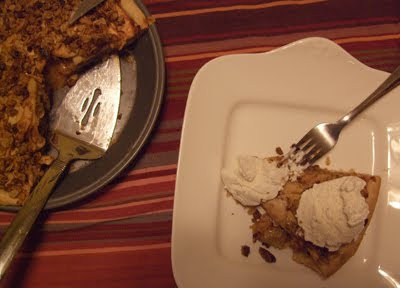 I overestimated how many apples to use in a single pie, but my mistake resulted in a delicious apple crisp. While the butter is melting, mix 1 tablespoon brown sugar, 1/2 teaspoon cake spice (or cinnamon would be great, too), 1/2 cup old-fashioned oats, and 2 pinches salt in a small bowl. Pour the butter over the dry ingredients and mix. Sprinkle the topping over the bonus apple filling. Add the crisp to the oven when you reduce heat to 375. Bake for about 45 minutes, or until the filling is thick and bubbling. Apple pie and vanilla ice cream. Proudly present both a pie AND an apple crisp to friends, family, co-workers, and strangers, and allow them to marvel at your ability to bake two (TWO!) things at once. « Dear Zucchini Diary: Ready, set, salad! I love the way you write about food. Even though I'm about 4 loads of laundry, 2 dirty bathrooms and 12 hours of freelance work away from making my own pie, I feel all warm and cinnamony just reading about your experiences with fall's yummiest treats. Good stuff, Buege. Er, VH. YAY!! Now I need pie. Lovely, lovely pictures, and I have never thought about putting rum or brandy into my apples before. I wonder why on earth not?? It seems so obvious now. Thank you.